Portland is known for it’s rain, clouds, food carts, hipster smash and all, but a lesser known fact is that Portland has HOBO SPIDERS(aka Tegenaria Agrestis). Poisonous flesh rotting Hobo friggen Spiders. In your house. On your bed. In your cereal. Kidding. Maybe? They are indeed here and in the numbers. For the most part all sources do report the Hobo Spider as being highly poisonous but there are a few sites claiming the spiders poise no actual threat to humans. I myself know someone who has been bitten by one and has a big scar from where it rotted her flesh for many months so I’m going with the poisonous scenario and not taking any chances. Some experts say that spiders rarely ever bite humans. They will even go as far as to say the human only gets bitten once or twice in a lifetime. I don’t buy it because I’ve been bitten far more than that for sure. The argument is that spiders only bite in self defense. And even now some say the Hobo is not even poisonous to humans. The reported symptoms of a bite from this specific arachnid don’t seem like much at all at first. In fact for the first few days of the bite you may have just a small mosquito like bite and be unaware of the fact that it was a venomous spider that bit you. After a few days the symptoms are a necrotic wound(rotting flesh) over a period of a few weeks. Another reported symptom is an incurable headache(aspirin won’t work) that can last up to 7 days. Not too bad right? Whatever you do, do not Google Hobo Spider Bites. I will not post a photo here because it is disgusting and nightmare inducing. When Is Spider Season? Bigger Spiders This Year? Because we had such an early and warmer summer we can expect to see more spiders and bigger spiders come Fall here in Oregon. The majority of them stay outside eating other insects most of the summer but once the temperatures start to fall, after a longer warmer season with a lot more food, they will start to come inside of your homes. They come in the Autumn in search for mates which is why they are always roaming your floors at night. The male Hobo only lives for a few months in the summer and gets eaten by the female after mating in the fall. The female can live up to 2 years. They are located all throughout the Pacific Northwest. This is a nocturnal spider that lives in dark corners, holes, planters, wood piles, cracks, etc. It’s what is known as a ground spider and spins thick funnel webs on the ground. Because they’re night insects they’re often discovered wandering in homes at night or once the light is turned on as they scatter back to hard to reach darker places. They’re very fast and this makes them really hard to catch or kill. These ground spiders run along the floors, baseboards, wall corners, etc and have a hard time climbing some walls. This is why they are usually found stuck in a sink or a bathtub with no way out. Put that faucet on full blast hot! If you’re anything like me, then you want these things gone, fast. There is no room in my home for poisonous spiders. Or any spiders for that mater. But even more so, if you’re like me then you also do not want to use poison, insect bombs, pesticides, toxic chemicals, etc. Or maybe you have an indoor cat and can’t don’t want it playing in the chemicals. Or one of those baby things that some humans have. These Spider Traps work perfectly. In fact, a little too good. I am horrified at the amount of creepy crawlers that I have caught in my bedroom alone. The spider traps are poison free! They are just really sticky surfaces that catch the spiders. After a lot of research they truly were the best option and I am glad I went with them. In order to be effective at trapping the spiders you must place them along walls and in corners. They really do work. Some say that eucalyptus leaves, peppermint oil, and orange oil will repel the spiders keeping them out. You would want to put this in those dark corners and closets where a spider would normally weave a web. You would also put this at the doors and windows to keep the new ones from invading. I have not tried this yet but plan on eventually buying some essential oils on Amazon. There is a very similar looking arachnid beast you may find in your home here in Oregon. The Giant House Spider aka Eratigena Atrica. I know, it’s horrifying. Look at how massive those things are. I’ve caught many myself in those traps. Both spiders hail from European lands and look very similar. Which is why they are the most submitted spider for identification in Oregon. Usually even just a photo won’t cut it and a professional arachnologist must look at the specimen under a magnifying glass. But a full grown giant will clearly not be a Hobo. It’s when they’re young adults and around the same size that identifying them and distinguishing the difference between the two is nearly impossible. 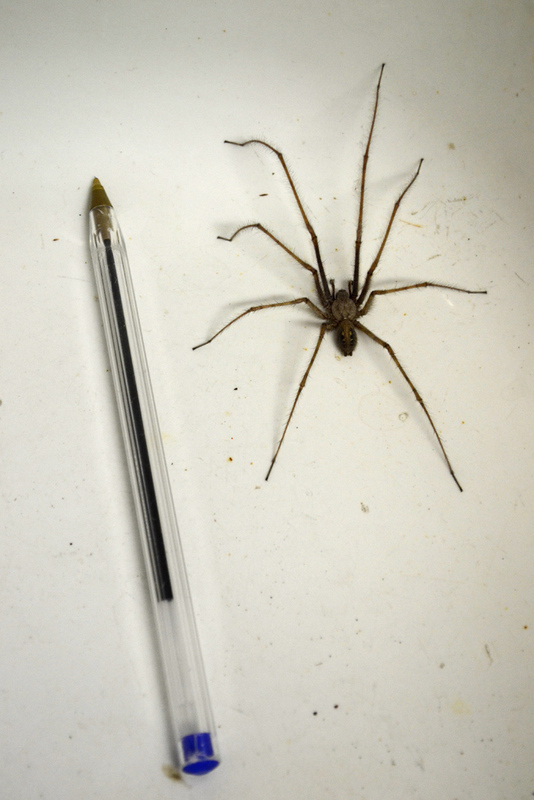 If you managed to catch a spider in your house with the Hobo Spider Traps I mentioned, then you can submit it to the State of Oregon Department of Agriculture for identification. The good news! Finally! While the Giant House Spider is creepy as all hell, it actually battles the Hobo Spider and dominates it so if you have these monsters running around your house, they are fighting off the smaller toxic spiders. It is said they are not known for having a venomous bite and they are often handled by humans as you can see on Youtube. But I can’t help it, they must be eliminated from my house. I can’t share a bed with that thing. Like the Hobo they also have a hard time climbing walls / surfaces and are often found stuck in sinks and bathtubs. Here is a list of the most common spiders in Oregon. Tips to get rid of spiders. Yes, another dangerous spider here in Oregon. Luckily they are a lot more rare up here in Portland and live mostly in Southwestern and Eastern Oregon. But they are a thing and they live in dark cool places, corners, under your bed, in your shoe, etc. Since you read all that, here’s a reward. I’m from the Netherlands. Hobospiders are indigenous spiders where I live. And I’ve never heard of anyone that was bitten by one these. Have they infested city dwelling places though? It’s when they get inside of homes, not when they roam the fields. I believe I was bitten by a Hobo Spider for a few reasons. They are common in the Pacific NW and my bites matched the description of the bites they leave. They were small red bumps that hardened. I got 8 to 9 bites. Most (7) were on or below my knee on both legs. (Two near my ankle, one on each calf, two on one knee and one on the other knee, one on my hip and a possible bite behind my ear). Another article I read said Hobo spiders were not poisonous. Judging from the way I feel, borderline on needing to go to hospital, I’d say they were mildly poisonous. On my second night into my infection, I felt I needed medical treatment but I’m afraid of hospitals and was afraid of the possible side effects of antivenom. If that wasn’t enough, I read that they give some bite victims morphine (and antivenom) for spider bites and an opiate addiction is the last thing I needed. And so last night, on my second night into my spider bite ordeal, I realize I’m kind of out of it, my head was spinning, lights were very bright, people seem like a blurry confusion to me and I’m just all around confused. I am simultaneously mentally tired and also unusually wired/amped, and uncharacteristically irritable. The first 24 hours I put charcoal on the bites. Then I took a warm/hot shower which made my symptoms worse. (I now think you aren’t supposed to put warm/hot water on your bites). Afterwards, I put hydro-peroxide on each bite and then a salt and water mixture. Both mixtures felt good when being applied. My symptoms continued to get worse for the following 24 hours. Finally the next day, I took charcoal pills and that gave me a lot of mental clarity but my blood pressure felt like it dropped quickly and drastically, and my lower legs became noticeably cold, so I’m not sure if charcoal is a good idea or not. Finally shortly after I took charcoal pills, I put a baking soda, salt and water mixture on my legs and that seem to bring the infection of my legs down a lot. I slept better and felt a whole lot better the next day except my lower legs continue to feel cooler than the rest of my body. I believe I got the spider bites from one of two places Urban Grinder Coffee or Planet Granite (a rock climbing gym). The gym is located on NW 14th in Portland, Oregon. The cafe is just a few blocks away near Safeway. And I got them Nov 3rd, 2016, which would be in the fall. This adds to my theory that the bites were from Hobo spiders. I’m a 150 pound woman and I went through a nightmare with these bites. I can’t imagine how it would have affected a small child if they had been bit like I was. I’m all for some alternative medicine, but you could have gotten really sick. Medical professionals have spent a lot of time and money to become the experts that they are.